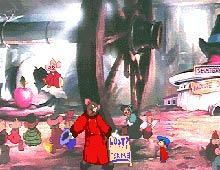 A fun game for kids based on the Disney movie of the same name, Fievel Goes Westfollows the adventures of a young mouse Fievel as he searches for his family in the New World. Both the interface and puzzles are a marked improvement over Capstone's frustrating Homey D. Clown. There is a few action sequences, but they are easy. Overall, a good introductory game that's fun for the whole family.